You know what they call a chicken dinner in Fortnite? A victory royale. I only know this through anecdotes told by friends who sometimes win matches. I mean, listen: I like the idea of winning, in the same distant way I like the idea of being a rock star. But that does not mean I am about to jump on-stage and challenge Clapton to a riff-off. I am not Jeremy Hendrix. Not so fond of second place? 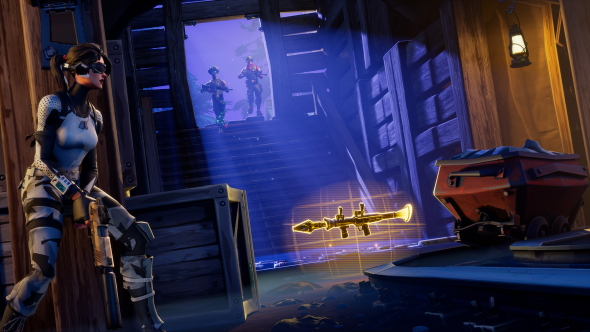 Read our Fortnite tips on weapons, items, locations, and tactics. Instead, I form part of a contingent of what my mum would call ‘shrinking violets’. Well, she would if she played Battle Royale, which she does not… but probably will if the current trajectory of player numbers continues. The violets practice avoidance above all else. On the Battle Bus, I wait for the very last stop – bailing out on the far side of the island, after nearly everyone else has lost patience. I avoid named locations, preferring shacks in the scrubland where there are no conspicuous landmarks filled with gear. By the time I touch dirt 25 players are dead. Typically, by the time I start grudgingly making a move towards the first of those wonkily concentric circles, only 50 remain. Sometimes there is gunfire on the wind, but I have no concept of what these early scuffles must look like – busy, frantic, and high-powered in the urban cornucopias where weaponry is plentiful. Again: not Hendrix. To extend the analogy to a slightly uncomfortable degree, I am a groupie. Not in the sense that I warm the Battle Bus bunks of the best Fortnite: Battle Royale players – I would never get close enough for that. Instead, I follow them, often literally, about 30 seconds behind as they make their way towards the shifting epicentre of the map. You can often see them from a distance, crossing chasms and climbing cliff faces, summoning the staircases in front of their feet like gods. Sometimes I walk the bridges they have left behind, stalking them all the way into the top ten. Cunning might regularly take me to the top tier – but, as with Elizabeth Swaney, the skier who qualified for this year’s Winter Olympics without performing a single trick, the gulf in actual ability becomes immediately and hilariously apparent once I get there. Actually participating in these final scraps is no fun for the intermediate player. I know what my fingers need to do to conjure a staircase with two walls either side – the bog standard in Fortnite defence systems – but by that point the panic has long since set in. I have outlived my welcome. Death, though, is when it gets really good. 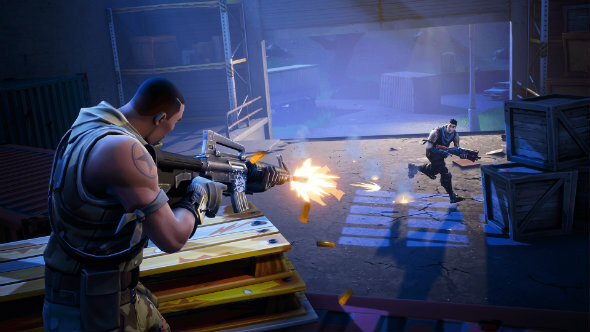 Once you are downed in Fortnite, the view swaps to your killer and stays with them for as long as you choose to stay logged in – or until they, too, are murdered by a more skilled player. It is often my killer’s killer who has something different and exciting about them. The very top players are distinctly un-violet. They do not crouch-walk. They stride across the land, unbothered by the possibility that they might be seen. Rather, they do the seeing, pushing aggressively forward like sharks, or heat-seeking missiles. Sharks attached to heat-seeking missiles. They fire rockets into the terrain – the kind of weaponry I never find while eking out an early game existence in one shack or another on the coast – proactively destroying the trees their quarry might be hiding behind. 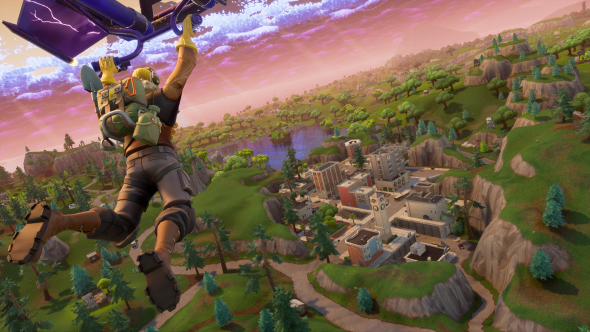 And when they find their target, I get to see Fortnite: Battle Royale’s unique strengths emerge full-fledged. 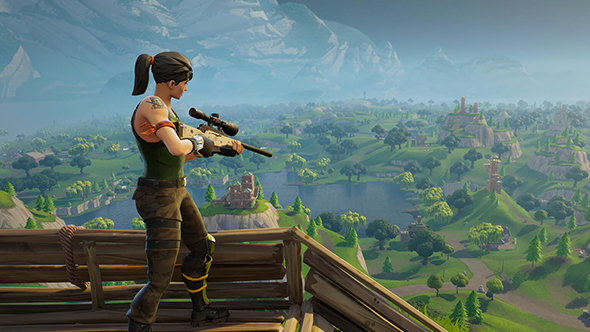 It would make absolutely no sense for Epic’s rivals in the battle royale genre to invest the years they have into fort-building tools. After all, they were perfected primarily for the game’s base defence mode, Save the World. But those tools fold beautifully into the formula here, elevating top-level battles to something strange and titanic. As soon as those final god-players clap eyes on each other, they begin their ascension – slapping down walls, then stairs, then floors and more walls, creating and climbing a precarious jenga tower at the same time. They hop up and down, stealing mid-air shots at their fellow deities with their sniper rifles, pausing only to glug from their seemingly bottomless decanters of shield potion. For the recently-deceased spectator, it is like being allowed to skulk in the corner at the qualifier of a new esport. Often the abilities of pros are only appreciable to those with similar expertise themselves – the innovation that is fielding a rare combination of StarCraft units, for instance, or the judgement inherent in leaving a LoL teamfight at the perfect moment. It is rare a top player gets to display their plumage so ostentatiously as they do in Fortnite: Battle Royale, where the violets can gasp in awe from their vantage point on the post-kill cam. If I were still alive, I would be too busy hiding or fumbling for the F3 key to notice any of this. And where would be the fun in that? No: better to be dead, at just the right time, and get a front row seat to a show unseen anywhere else in multiplayer gaming.